The Schwarzenbergplatz is one of the most important squares in central Vienna, connecting the Ringstraße with the Zweierlinie, a parallel road that was historically the practical, "non-representative" street that provided supplies and transportation to the palatial buildings on the Ring. The Schwarzenbergplatz is named after the Palais Schwarzenberg of the family of Bohemian noblemen, which holds the most prominent location on the square. Unfortunately, the Schwarzenbergplatz shares a fate with nearby Karlsplatz: Traffic, traffic and more traffic make it rather unattractive. One prominent feature of the square is the Hochstrahlbrunnen, a large fountain that looks like a geyser with pseudo-natural rocks in a circular pool. Sandwiched between the Palais Schwarzenberg and the Hochstrahlbrunnen, you find the Soviet memorial "Heldendenkmal der Roten Armee" - its shape and array corresponds with both, Palais and fountain. However, the Hochstrahlbrunnen is much older. It was built to celebrate the construction of the first water pipeline from the Styrian alps to Vienna in 1873. In the decades before, the water supplies from various springs in the Vienna Woods and through the Wien River had proved to be insufficient for the ever-increasing population of Vienna. The pipeline was a major breakthrough for the modernisation of Vienna that took place in the second half of the 19th century; other landmarks of Vienna that can be linked to this enterprise are the watertower of Favoriten and the aqueduct that is still in use in the South of Vienna (for example in Mödling). Ever since 1873, the Viennese are very proud of their Alpine spring-water from the tap. When the project was finished, the engineer Anton Gabrielli - who ran the building company in charge with the construction of the pipeline - donated the considerable sum of 200,000 Kronen to construct the Hochstrahlbrunnen. Some 20 years later, an even higher sum was donated to illuminate the fountain artificially - in 1906, a remarkable attraction for the Viennese. Today, the Hochstrahlbrunnen is still lit up at night, shining in blue, red and green. The edge of the Hochstrahlbrunnen has a circle of 365 little fountains, representing the individual days of a year. 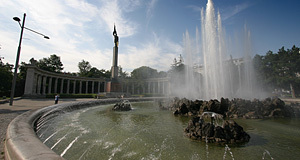 Six medium-size fountains and a central island symbolise the seven days of the week. 12 high fountains symbolise the months of a year, and 24 small fountains for the hours of a day. From the central island, there are 30 fountains that represent the days of a month. This is a re-arrangement that is in place since 1906. The original array of the Hochstrahlbrunnen included one central fountain (one year), four medium ones (four season) and 365 small fountains (days of the year). In the patch of green right between the Hochstrahlbrunnen and Prinz-Eugen-Straße, you can see a memorial for Eduard Suess. He was a geologist and delegate to the Vienna city council - he started the project of building the pipeline in 1836 and it was also his merit to supervise the training of the Danube and the Wienkanal, the canal of the Wien river. Attractions nearby the Hochstrahlbrunnen and Schwarzenbergplatz are numerous: Towards East, you find the Akademisches Gymnasium, the Akademietheater and Wiener Konzerthaus; the Stadtpark and Kursalon; the National Mint; the Museum of Applied Art. Towards Rennweg, you find the Gardekirche, the Salesianerinnenkirche and the Belvedere Palace. Towards West, you get to the Karlsplatz with Karlskirche, Wien Museum, Künstlerhaus, Wiener Musikverein and the Secession. Towards north, you get to the Ringstraße and straight into the first district.